The Alimentarium is a museum and information center on food, its production, nutritional value, and cultural history associated with eating. 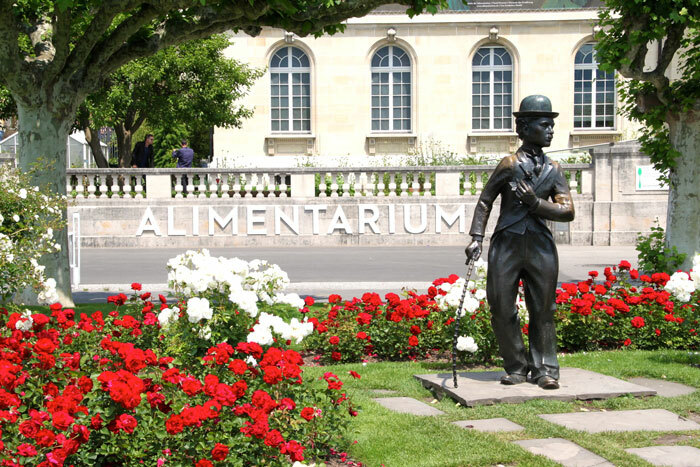 The Alimentarium Food Museum on the Vevey lakeshore of Lac Léman has a wealth of information on food, nutrition, and the cultural history of eating. The museum covers several themes including cooking, eating, producing, buying, and food in social media. Historic items are enhanced by interactive multimedia displays allowing for entertainment for children of all ages as well as adults. The lovely edible plants garden is open for free during museum hours. The Alimentarium Food Museum is housed in the former 1920’s head office of Nestlé, one of the world’s best-known and largest brands. The museum covers all topics related to food from ancient times to the present. The Food Museum is not the Nestlé Museum – despite the close association, very little is done to push Nestlé products. Only in the lovely wood-paneled Nestlé Room, which was the former boardroom, is the history of Nestlé explicitly explained in a few information panels, mostly on the original founders of the related companies. The main exhibits in the Alimentarium are divided into sections on food, society and the body. All information is in English, German, and French. The food section demonstrate how food is grown, processed a prepared. The Society section look at different eating habits and values related to food in various parts of the world. It also look at current social media habits to photograph food and food port. The body section is the newest exhibition and asks two main questions: why do we eat and what do we think about eating. Ample interactive and electronic activities invite visitors to participate and share ideas. The Alimentarium Musée de l’alimentation (Museum der Ernährung / Food Museum) is open Tuesday to Sunday from 10 am to 5 pm (closing 6 pm on weekends). Admission is CHF12 for adults and free for accompanying children under 16 years old. The Swiss Museum Pass (SMP) is valid. Food-related demonstrations and workshops are held frequently but are usually in French only and require advance reservations. The garden has a large range of well-labeled edible plants ranging from the obvious vegetables and herbs to colorful flowers. The garden is freely accessible during museum opening hours and has a small picnic section too. The café in the museum has a very limited, if tasty, menu during lunchtime only. 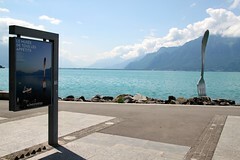 The Alimentarium is on Quai Perdonnet on the lakeside promenade of Vevey right in front of the 8-m stainless steel fork sticking out of Lake Geneva. Originally erected in 1995 for the special ten-year anniversary of the museum, the fork departed a year later and only permanently returned to Lake Geneva in 2009. The Food Museum is a few blocks from Vevey’s Grand Place or roughly halfway between the Vevey-Marché and the Vevey-La Tour CGN lake boat landings. 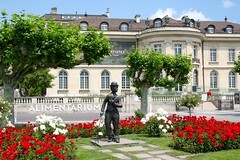 Vevey has a very pleasant lake promenade and old town area. Other interesting sights in Vevey include the Museum of Photography, the Vevey History Museum and the fine art Jenisch Museum. A pleasant lakefront promenade walk leads to La Tour-de-Peilz and the Swiss National Museum of Games.